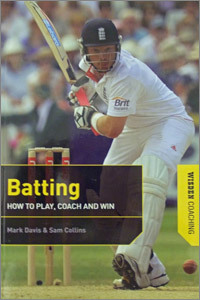 The other in the series of coaching books by Mark Davis and Sam Collins concentrates on batting and starts with a generous foreword by Craig Kieswetter, who was one of Mark Davis's pupils at Millfield. This batting book follows the same pattern as the bowling starting with the basics (including set-up, equipment, running between the wickets amongst other areas), a vast array of shots are described before moving onto the advanced stages ( playing various styles of bowling, reading the pitch) and continuing with limited-overs batting and the mental side of batting. The basics in the first chapter detail such aspects as the stance, grip and guard; how to choose a bat and other equipment; running between the wickets and calling before ending with a glossary of terms of deliveries which batsmen will come up against. Naturally, the diagrams and photographs are excellent and complimented by a series of expert coaching tips. Shots in the second chapter encompass not only the usual shots ( drives, hooks, sweeps etc) but also the more recent, innovative shots which have entered the game such as the switch-hit. The ones credited to particular players, Tillakartne Dilshan and Doug Marillier, are also shown again with photographs as well as a description. The third chapter, The Advanced Stages, analyses tactics and how to play various types of bowling as well as reading the pitch before moving on, in Chapter Four, to how to bat in limited-overs matches. It speaks volumes for today's brand of fast cricket that the 50 overs match is described as long-form cricket! Pointers for batting, chasing down a total, 50 overs and Twenty20 are also described within this chapter. The mental side of batting details how to cope with both success and failure as well changing your thought process when things are not going well and practice in both summer and winter as well as other areas are discussed in the sixth chapter, practice, Practice, Practice. Like the bowling book, this is another invaluable coaching book which keeps abreast of all the changes. With its advice with both photographs and diagrams, expert tips from top players and other expert coaching tips, this book should prove as useful as the bowling book.